Following the bounce in global equity markets from their respective December lows, March saw more moderate gains with the S&P 500 Index returning 1.9% for the month and global markets gaining 0.7%, as measured by the MSCI ACWI ex USA Index. But what may have been bigger news were the declining interest rates in most major countries. The bellwether ten-year US Treasury Note fell from 2.7% to 2.4%, with key global rates also falling, including the German ten-year yield dropping again to a negative interest rate. The comparison of global equity and bond markets during March sums up the contradictions facing investors today. Economic and profit growth is mixed, or slowing, across the globe (including within the US) consistent with falling interest rates. And this typically reflects investors’ waning confidence in the global economy. Yet, global central banks continue to stretch their focus beyond the traditional mandates of maximum employment and price stability to include “stability” within the capital markets and this perceived safeguard has certainly factored into rising equity markets. Investors’ prevailing mood has shifted between these paradigms, particularly since January of 2018. Many of the political and economic issues that have altered investors’ confidence during this time remain today and few have seen any resolution. This list continues to be led by US/China trade relations and Brexit, each of which may have turning points in April, but without consensus on likely outcomes. Add to this the slowing rate of economic and profit growth within the US and many other regions and it becomes apparent that the global economy is at a crossroads. With the breadth of political, economic and market ambiguities, this is clearly a time to carefully consider risk-taking within one’s portfolios. For many, the current environment suggests a notion of caution in risk-taking to be appropriate, despite the recent stock market bounce from late 2018. Investing is not risk-avoidance, but rather, taking risks believed to offer a reasonable probability for an appropriate return. As each share of stock represents a piece of equity ownership in a company, it follows that the value of that stock should be influenced by both the company’s current earnings and its future earnings potential. As an investor, one would likely be interested in the company’s future prospects more so than its current state, although they often go hand-in-hand. Thus, the opportunity, and the risk, in equity investing is that the future cannot be known with certainty. It is investors conclusions regarding forward-looking information that most often influences a stock’s future price changes and that of the related indexes. And, because earnings greatly influence whether a company is growing in value or not, its stock price is strongly influenced specifically by expectations regarding its future earnings prospects. This chart looks at this relationship for the Philadelphia Stock Exchange’s Semiconductor Index. This index is a collection of technology companies and is often viewed as a bellwether for the technology industry. Not only is it representative for the industry, but many see technology as a leading sector in the US economy and look at this index, and others, to help inform them on the broader US stock market. While the chart is fairly simple, it raises a question regarding the current state of the market and economy. Through late 2018 the direction of the index’s price (top clip) aligned closely with analysts’ collective forward earnings estimates for the index’s underlying companies (bottom clip). But since December of 2018, the two have diverged, with stocks moving higher while earnings expectations continued to be downgraded. This relationship between the direction of stock prices and the direction of earnings growth would be expected to realign. And while this disconnect can persist for a time, history suggests they realign sooner than later. Will investor expectations prove to be right and earnings turn upward? Or, will stocks eventually realign with expectations of declining earnings? Quantitative Advantage, LLC (QA) is an investment advisor registered with the Securities and Exchange Commission and is a limited liability company organized in the state of Minnesota. Registration of an investment advisor does not imply any specific level of skill or training. QA Wealth management is a division of QA. This information has been prepared by QA, is provided for informational purposes only and does not constitute investment advice. It contains general information, is not suitable for everyone and is subject to change without notice. The views and opinions expressed in this report are solely those of QA and are current as of the date of writing. While the content is provided in good faith to provide a general commentary of current market factors and conditions, the views and opinions expressed are limited in scope and QA makes no representation or warranty as to the accuracy or completeness of the information provided. Past performance of the global investment markets is not a guarantee of future results. The index performance results referenced in this report represent past performance and are not a guarantee of future performance. Investment returns and principal value will fluctuate and are subject to market volatility, so that a client’s investment, when sold, may be worth more or less than the original cost. Indices are unmanaged and investors cannot invest directly in an index. An index’s performance does not reflect the deduction of transaction costs, management fees, or other costs which would reduce returns. 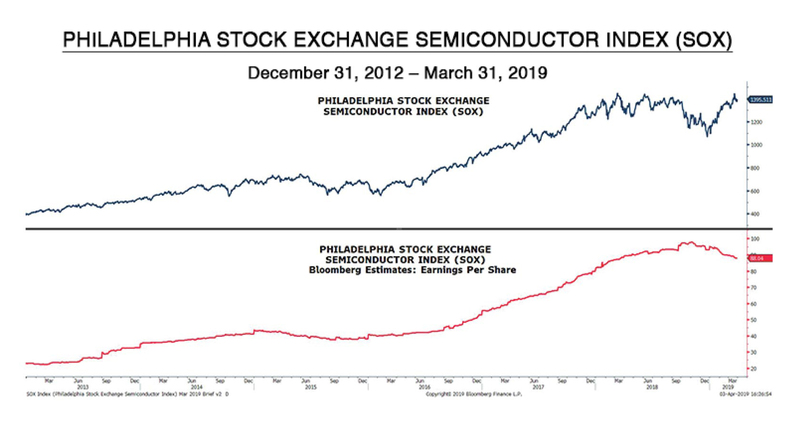 The Philadelphia Stock Exchange Semiconductor Index is a modified market capitalization-weighted index composed of companies primarily involved in the design, distribution, manufacture and sale of semiconductors. For additional information regarding this index, please refer to the sponsor website at https://indexes.nasdaqomx.com. For more information about QA, its investment advisory and management services, fees, and the risks associated with the investments which QA’s investment strategies and model portfolios may make, please review QA’s Form ADV disclosure brochure, which is available at www.QAwealthmanagement.com, or upon request from QA’s compliance department by telephone at 866-767-8007, by writing to 10400 Yellow Circle Drive, Suite 303, Minnetonka, MN 55343, or by email to compliance@QAwealthmanagement.com. Please review the Form ADV disclosure brochure carefully before or at the time you enter into an agreement with QA. Monthly Brief May 2018 – Global Economic Growth: Still Synchronized?